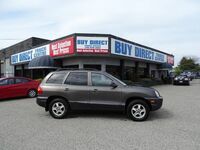 Buying a used vehicle is the way to go, and we are here to tell you why. 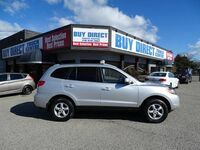 We want to focus on used Hyundai Santa Fe vehicles, which we have a large supply of here at Buy Direct Truck Centre. The starting MSRP of a 2019 Hyundai Santa Fe is $25,500, but if you buy used, you can get better prices than the MSRP. The second a new car leaves the dealership lot, its value falls, and we take advantage of that by selling used vehicles at a better price. Santa Fe vehicles are also efficient despite their large size. They get an EPA estimated 22 mpg in the city and 29 mpg on the highway, which may vary by model year. Keep reading below to learn about unique features on Santa Fe vehicles and the benefits of buying pre-owned vehicles. In the chart above you will notice that Hyundai Santa Fe vehicles do not compromise on any of the three categories. They truly have it all, with stylish exterior features, a powerful engine with two drivetrain options, and innovative technology. Plus, these are just some of the many features that Hyundai Santa Fe vehicles have to offer. 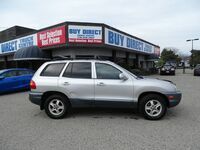 Our inventory of used Hyundai Santa Fe vehicles is well-stocked and versatile. We offer a variety of colors and trim levels to fit a wide array of tastes. Additionally, we often have more than one model year in stock, so you can compare prices and feature options of different models all in one place, by taking a test drive or asking a member of our sales team for further information. Of course, the biggest benefit is our prices, which are well under what you would pay for a new Hyundai Santa Fe vehicle from a Hyundai dealership. Drive in style, but don’t break the bank.